It’s a big step deciding the get braces as an adult. Researching the products available to get your desired result at the best cost is essential to the process. I know what your thinking, “Braces are for Teenagers” and you don’t want to be walking around with a mouth full of metal at your age. I’m here to tell you, if you are a candidate, it can be done another way. Getting clear braces could be the right choice for you. There are many reasons to consider braces (even as an adult). The most important thing is healthy teeth and proper jaw alignment. How does your teeth being strait contribute to this? 1. When teeth are crooked or crowded, it makes them harder to clean. Without proper cleaning of neglected, hard reached area’s, tooth decay can result. This could lead to gum disease and eventual tooth loss. 2. Misaligned teeth can contribute to abnormal wear of teeth surfaces. This can cause you to wear down your enamel, chip or break a tooth. This problem can also lead to misalignment of the jaw joints. That misalignment can lead to chronic headaches, neck pain or face pain. 3. Crooked teeth can cause injury more easily to your mouth, tongue and lips. 4. An attractive smile is more engaging . You will feel more confident and smile more. 47% of people notice a person’s smile first when they first meet someone. The office of Glasscock Dental offers the Clear Correct system. We feel this system is the most cost effective, comfortable and provides are patients with that beautiful, straight smile they are looking for. Please contact our office to find out more about our free consultation to see if you are a candidate for Clear Correct clear braces. What are the benefits of getting Braces? Let’s face it. We all want to look our best and braces have come a long way from the 80’s headgear that traumatized many American teens. It is a proven fact that people with crooked, deformed or damaged teeth smile much less than someone with perfect pearly whites. Revolutionary new clear braces, like Clear Correct, are a new and improved way to give you that perfect smile without the trauma of the past. What most people are unaware of is the overall benefits that braces provide beyond your obvious physical appearance. Clear Speech- Teeth in the wrong position can make it difficult to pronounce certain sounds. Easier Time Eating-properly aligned teeth have a better bite pattern and make it easier to chew and bite down of foods. Also, straight teeth won’t wear as quickly. Less Accident Prone Teeth- If your teeth are crooked, and sit outside your bite pattern, the likelihood of you damaging a tooth or cutting your mouth or lips increases. Fewer Headaches- Crowded teeth wear unevenly. Uneven wear of your teeth puts pressure on your jaw and can cause you to have many headaches. Improved Gum Health- Straight teeth are more effectively brushed and flossed. Well maintained dental care will help you to maintain healthy gums. Better Overall Health- Your oral care directly impacts your physical health. Straight teeth makes proper oral hygiene most effective. Cost Effective Dental Care- You have fewer major dental issues with straight teeth. The smaller the issue, the less the cost. Lower Risk of Soft Tissue Injury- crooked teeth can damage the inside of your mouth or lips. This could lead to infection. Self Esteem- A person with an award winning smile is proven to smile more often then someone that does not. Happy smiling people are more inviting. If you want more information on Clear Correct clear braces, please feel free to give the office of Dr. David M. Glasscock a call. We care about your oral health and want to see you smile. Clear Correct or Metal Braces? There is a much easier alternative to metal braces. Contact Glasscock Dental to see if Clear Correct is right for you! Your doctor sends your records to ClearCorrect along with a prescription. ClearCorrect uses those records to create 3D models of your teeth. Following the instructions provided by your doctor, ClearCorrect creates a “treatment setup” representing the desired position of your teeth at the end of treatment. At the same time, ClearCorrect also manufactures “Phase Zero” passive aligners designed to fit your teeth and get you accustomed to wearing aligners right away. When you and your doctor are satisfied with the fit of Phase Zero and the projected results shown in your treatment setup, ClearCorrect maps out a plan for gradual adjustment throughout your treatment. Then the manufacturing process begins. Using the latest 3D printing technology, ClearCorrect creates your custom aligners with computer precision. 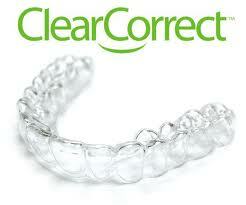 ClearCorrect then sends your first phase of active aligners to your doctor, who dispenses them to you. You’ll wear your aligners all the time, except while eating and drinking or during daily tooth care, such as brushing and flossing. Your ClearCorrect aligners will be so clear they’ll barely be noticeable, so they won’t have an impact on your day to day life. Aligner by aligner, you’ll be able to see the difference as your teeth slowly adjust and align to your target smile. You’ll visit your doctor periodically to check on your progress and get new phases of aligners, until you eventually have the straight smile you’ve always wanted.